Below is a selection of what our happy customers have said..
"We had a problem with our bathroom lighting so we called Mr MacGregor. He arrived promptly and gave us detailed information to understand the problem. He fixed it all up in no time for a reasonable price and we were very happy with the work done. Highly recommended and would definitely use again." "We have used Dave on many projects over the last 2 years and have found his conduct and workmanship to be of the highest standards. We will, without doubt, be using his services on future projects and would highly recommend him to anyone in need of an electrician." 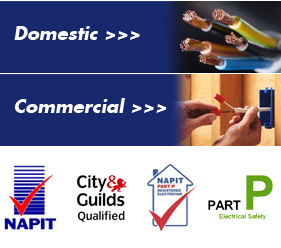 "Friendly local Electrician, provides excellent standard of service, completed within quoted cost. We would not hesitate in recommending Dave andwill definitely use him again in future." "I have just used David for an electrical job for the first time and will certainly be using him again. He was very clear in explaining what was involved, gave a competitive quote, came when he said, and did the job quickly, neatly and without fuss. Very happy to recommend him." "I needed an electrician to fix a problem with lights in the kitchen. I called David, he attended promptly, and was both efficient and professional in his approach. Not only did he resolve the initial problem, but as a result of his advice the overall lighting in the kitchen is now greatly improved.I have no hesitation in recommending MacGregor electrical." "Great job - really pleased with the quality of work!" "Thank you dave, dave recently re wired a house I'm renovating. Dave was recommended by the builder I used I did get other quotes for the electrical work. Dave was the cheapest quote and his work was excellent. I had several changes to the original job, nothing was a problem for dave and he was always happy to accomadated any changes I wanted and was always available to answer any questions I had, excellent." "Mr. Macgregor fitted a light fitting in my dining room and sorted out some faulty wiring in the sittingroom. He did a professional job at a competative rate. I would definitely recommend him." "Dave has rewired my garage which I've converted into an art studio, he's put daylight light fittings up and fitted new sockets in new office area. He has also upgraded my fuse board in my house and put new earthing in. Dave did a really good job, the price was good, I know this because I had other quotes for the electrical work. I have recommended Dave to a friend who has had a burgular alarm installed." "I recently bought a property in Lincoln to renovate. The electrician did a full re-wire for a good price. Really pleased with the work"